The researchers designated households in their sample as being heavily in debt if their monthly loan payments and other debt obligations exceeded 40 percent of their pretax income. That is a high share of income to devote every month to paying off loans, rather than buying groceries, saving for retirement, or utilities. Soaring house prices and bigger mortgages played a major role in throwing many households into debt. The near collapse of the global financial industry was triggered by a cascade of defaults on subprime mortgages. Brokers for these risky home loans frequently targeted minorities and recent immigrants, who are less likely to have college degrees. 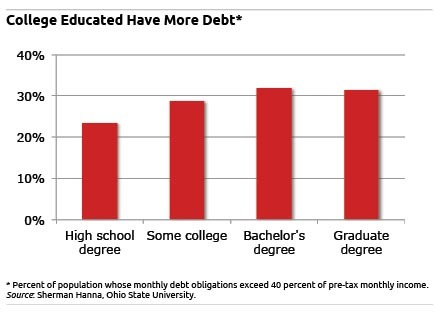 Hanna suggested that his counterintuitive finding – more education means more debt – may partly be explained by the greater optimism that college graduates may have about their futures and employment prospects. But the findings study may throw cold water on arguments that more or better financial education “will solve all our problems, if we just point things out to people and educate them,” he said. Debts included in the study’s 40-percent debt threshold included loans for cars, homes and home improvements, pension loans, lines of credit, credit card and other financial obligations. The researchers counted rent payments as a type of “debt” obligation in order to put renters on an equal footing with homeowners. They used data from the Federal Reserve’s Survey of Consumer Finances. To receive a weekly email alert about blog posts, click here. Squared Away supporters can also like us on Facebook! With so many FREE online courses accredited for many good universities such as Princeton and Stanford, I don’t really understand why people still keep spending fortunes by going to the campus. You don’t need a classroom to learn and do things to help other people and get paid for it. Being practical is not a sign of weakness or having disadvantages in life. I agree with John, there are many opportunities to study and learn without spending big money. Students should also keep in mind that they should never accumulate a total student loan debt amount that exceeds what they expect to make their first year in the workforce after college. While there is not much college students can do about the rising costs of education, they can be proactive in debt prevention and minimization by seeking loan alternative options and/or borrowing responsibly.